Saturday: 8 a.m.–7 p.m. Thursday: 8:30 a.m.–9 p.m.
Stop by the Alumnae House registration tent to receive your welcome card with your housing assignment and meal reservations. New since your last Reunion: You will also receive a key card to access class headquarters and your house for the weekend. Then head over to your class headquarters. If you arrive after registration closes, call Campus Police at 413-585-2490; they will let you into your house. However, you must stop at the Alumnae House the next morning to check in and get your key card. Watch for news from your class Reunion team about the exciting programming they have planned. Check your class website and social media sites for updates. For alumnae and guests who have purchased housing. Current students will share how their studies at Smith have shaped their off-campus endeavors and how those experiences have enriched their liberal arts education at Smith. Susan Fliss, dean of the libraries and Dano Weisbord, director of CEEDS and campus planning. Experience the rich intellectual life of Smith students today by attending brief lectures by Smith faculty. Free and open to all. 50th Reunion class social hour hosted by President McCartney. 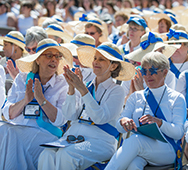 Alumnae participating in Ivy Day activities are asked to wear white with white or light shoes. In the event of rain, the Alumnae Parade, Alumnae Awards Presentation and Ivy Day Awards Convocation will be held in the Indoor Track and Tennis Facility (ITT). The signal for such a change in venue will be the ringing of the college bells at 8 a.m.Disability Accommodations: Anyone with physical disabilities who wishes to be dropped off near the entry to the Quadrangle for the awards convocation should speak to the police officer at the top of Paradise Road. Lunch will be distributed at Chapin Lawn. Check your class schedule for class programming. A bounce house, face painting, art activities, and green fun with the Botanic Garden. Opens houses: Hillyer Art Library, The Design Thinking Initiative, Jill Ker Conway Innovation & Entrepreneurship Center, Special Collections, the Botanic Garden, The Narratives Project, the Libraries, and the Museum of Art—all of these incredible resources make Smith unique. 3–4 p.m. Conversation and Q&A with Honorary Degree Recipients —featuring Elizabeth Alexander, Drew Gilpin Faust, Niki Sauvage Tsongas and Ai-Jen Poo. Panel moderated by President Kathleen McCartney. Stroll the campus as music fills the air and the grounds come alive with the glow of delicate Japanese paper lanterns. For all Reunion classes, featuring a DJ, cash bar, popcorn, photo booth, and glow sticks. The outdoor Commencement Ceremony will live stream from Weinstein Auditorium (open seating). The indoor Commencement Ceremony will be held in the ITT and simulcast live to Sweeney Concert Hall in Sage Hall. 1 p.m. Residence houses close.